I hope that these notes follow the lead of Professor David Mackay in as much they attempt to quantify and thus question many of the aspects of the Green dogma and the assertions of the possibility of Catastrophic Anthropogenic Global Warming / Climate Change just using some simple mathematics. But at same time he was devoutly rational preferring mathematics to Green religious conjecture. Accordingly, one of his most recent quotes was that the attempt to try to power the UK economy with weather dependent Renewable Energy was as he said “an appalling delusion”. And as he has said it only takes some trivial “back of the envelope” calculations to prove that it is so. This and my other notes do some of those trivial “back of the envelope” calculations disproove points of Green dogma. However there is one point where I would entirely disagree with Professor Mackay i.e. that Carbon Capture and Storage, CCS, is an essential technology to be developed in order to avoid CO2 emissions. I would rather characterise CCS as “an expensive way of throwing away comparatively small quantities of useful plant food”. the world needs its atmospheric CO2 for the survival and fertilisation of plant life: it thus supports all life on earth. atmospheric CO2, whether Man-made or mostly naturally occurring, is not pollutant. the effectiveness of CO2 as a Greenhouse gas rapidly diminishes logarithmically with increasing concentration. although several scientific sources assert that CO2 has no real effect on global temperature, these notes calculate the effects of CO2 as presented in data from climate activists: they find that the impact of rising CO2 concentrations on global warming is even at its greatest extent to be insignificant. so little of the effectiveness of CO2 as a greenhouse gas now remains that there is no possibility of ever attaining the much feared +2°C temperature rise caused by Man-made CO emissions, that is thought to be so catastrophic by alarmists and sadly by convinced Western world politicians. increasing CO2 in the atmosphere can only lead to very limited further warming and certainly not to any catastrophic and dangerous temperature increase. mankind’s attempts to control global temperature by the limitation of CO2 emissions from combustion of fossil fuels can only ever have marginal or immeasurable effects. therefore all de-carbonisation efforts by mankind are misguided and irrelevant. As global temperatures have already been showing stagnation or cooling over the last eighteen years or more, the world should now fear the real and detrimental effects of global cooling, rather than being hysterical about limited, beneficial or now non-existent further warming. Photosynthetic plants originally evolved in an environment of atmospheric CO2 at many 1000’s ppmv. In the horticultural business plant growth is routinely enhanced by adding levels of CO2 in their greenhouses to be three times or more than that of the external atmosphere. Current CO2 concentrations at 400 ppmv are low when compared with the average atmospheric CO2 concentrations over the past 300 million or so years which ranged between 1000 ppmv and 1200 ppmv. So at present levels the earth’s biosphere is still only marginally above a minimal CO2 level for plant and thus planetary survival and any further concentrations of atmospheric CO2 can only have a positive entirely beneficial effect on plant growth. As at current levels the world is at a comparatively low level of CO2 and plant life is still close to CO2 starvation. In order to absorb sufficient CO2 for their survival, plants have to have larger stomata in their leaves: these larger stomata transpire more water vapour. So higher CO2 concentrations reduce the amount of water that plants need for survival. Recent publications have now established that over the past few decades the earth’s vegetation has grown substantially by ~15% globally. This is attributed simply to the higher levels of atmospheric CO2. In the light of these well known facts, atmospheric CO2, whether Man-made or naturally occurring, cannot be regarded in any way as pollutant. Rather atmospheric CO2 should be regarded as the very stuff of life it is on planet Earth. The temperature increasing capability of current levels of atmospheric CO2 is thought to be real enough but the effect is minor and very marginal. Many climatologists and meteorologists consider the effect of atmospheric CO2 to be virtually insignificant amongst the other major causes of climate variation, (the sun, planetary mechanics, ocean circulations, etc. ), whereas others, “Climate Alarmists”, assert that CO2 alone is the main driver of climate change and the control knob of global temperature. These notes quantify the current and likely future Man-made CO2 temperature effects on climate, according to the publications accepted by Global Warming Alarmists. The influence of CO2 concentration on temperature is known and is widely accepted to diminish progressively as its concentration increases. This is a crucial fact. This fact is not acknowledged in the IPCC summary for Policy Makers. The physics of CO2’s effect on temperature is not linear, its potency falls off logarithmically with increasing concentrations. Both Global Warming advocates and Climate Change sceptics agree on this. IPCC Published reports, (TAR3), acknowledge that the effective temperature increase caused by growing concentrations of CO2 in the atmosphere radically diminishes with increasing concentrations. This information is presented in the IPCC reports. However it is well disguised from any lay reader, (Chapter 6. Radiative Forcing of Climate Change: section 6.3.4 Total Well-Mixed Greenhouse Gas Forcing Estimate). The logarithmic diminution effect is an inconvenient fact for Global Warming advocates and Climate Alarmists. It is nonetheless well understood within the climate science community. But the effect is not much discussed nor ever emphasised. An illustration of the CO2 diminution effect with increasing concentrations, can be imagined as if one was painting over a window with successive layers of white paint. The first layer will still be translucent, subsequent layers will progressively reduce the translucency until the window is fully obscured and thereafter further paint layers can make no further difference to the fact that the window is already fully obscured. Similarly extra concentrations of atmospheric CO2 have ever diminishing effects on temperature, until at about 1000 ppmv they become totally negligible. The logarithmic diminution effect is the likely reason there was no runaway greenhouse warming caused by CO2 in earlier eons when CO2 levels were known to be at levels of several thousand parts per million by volume, (ppmv). Using the currently accepted estimates the following simplifying diagram shows the logarithmic diminution effect using tranches of 100 ppmv up to 1000 ppmv and the proportional significance of differing CO2 concentrations on the biosphere. Up to ~200 ppmv, is the equivalent to about ~77% of the temperature increasing effectiveness of CO2. This level of atmospheric CO2 concentration is absolutely essential to sustain photosynthesis in plants and thereby to maintain the viability of all life on earth. The CO2 level can diminish significantly in glacial ice ages and as a result life on on earth has often been close to real extinction. ~300 ppmv was an approximate agreed level prior to any industrialisation, this atmospheric CO2 made the continuing survival of the biosphere possible, but it is only causing a further 5.9% of the CO2 Greenhouse warming effect. Following that a further 100 ppmv, (now accepted by the IPCC both a natural effect and to be only ~50% man-made), it adds ~4.2% of the CO2 effectiveness brings the current level ~400 ppmv. CO2 concentration at 400 ppmv is already committed and immutable. So CO2 has already reached about ~87% of its potential warming effect in the atmosphere. Adding Man-made or naturally derived CO2 in increasing amounts can only have the minor effects as shown below in 100 ppmv tranches. Up to 400 ppmv is committed and immutable, as shown shaded above. At 400 ppmv only ~13% of the effectiveness of CO2 as a Greenhouse Gas now remains even up to the level of ~1000 ppmv. And beyond that ~1000 ppmv level higher concentrations can have virtually no further warming effect. This means that a doubling the CO2 concentration, (Climate sensitivity), from 400 ppmv to 800 ppmv can only add about 10% to the current effectiveness of CO2 as a heat retaining Greenhouse gas. Skeptical scientists and the IPCC publish alternate views of the reducing effect on temperature of the importance of CO2 concentration. These alternates are proportionally equivalent but vary in the degree of warming attributable to increasing CO2 concentrations. The IPCC publishes the following three views of the total effect of CO2 as a greenhouse gas up to ~1200 ppmv. In total they range in temperature from +6.5°C to +14.8°C and could give future additional warming between the current ~400 ppmv level and the 1000 ppmv However when the values between 400 ppmv and 1000 ppmv are scaled of the IPCC chart the range for level of in the range of +~0.49°C and +~0.85°C. the Carbon Dioxide Information and Analysis Centre and Murry Salby recently asserted that CO2 only contributes ~2% too the overall Greenhouse effect. What all these different analyses show is the amount of future warming that might be attributed to additional atmospheric CO2 in excess of the current level of ~400 ppmv is going to be between marginal and non-existent. Looking to the future in excess of the current 400 ppmv, wide variation exists between the different warming estimates up to 1000 ppmv. So the range of the CO2 element of the +33°C GreenHouse effect ranges from ~2% to ~21%. A proportional comparison between these estimates are set out below in the context of the overall ~+33°C total Greenhouse Effect. The temperature increase figures shown here in orange are for the increase in CO2 concentration from 400 – 1000 ppmv. Five postulates are shown here, which have been provided by sceptic sources and the IPCC. The graph shows in orange the remaining temperature effect of CO2 that could be affected by radical worldwide global de-carbonisation policies, maintaining CO2 levels at the current 400 ppmv. The warming that might result by raising the CO2 level from 400 ppmv up to 1000 ppmv, according to each of these postulates. The range of alternate postulates shows CO2 affecting in the range of ~2% – ~20%. Of these a median value of ~10% is agreed between Lindzen, (as published by the IPCC) and other sceptic academics such as Plimer, Carter, Ball and Archibald. Even lower values are quotes down to ~2% (Salby), whereas other IPCC quoted values give CO2 a significance of up to ~21%. In alarmist terms of course, a CO2 concentration reaching 1000 ppmv would be considered as beyond catastrophic even though at a maximum it might only give rise to a temperature increase of ~0.49°C according to the median case. The concomitant effect of the higher levels of warming from atmospheric CO2 that have been postulated is that the proportion of the total ~33°C then attributable the water vapour and clouds in the atmosphere is displaced so as to be unrealistically even down to 79%. It is simply not plausible that CO2, still a minor trace gas in the atmosphere, currently at the level of ~400 ppmv, or 0.04%, achieves such radical control of Global temperature, when compared to the substantial and powerful Greenhouse Effect of water vapour and clouds in the atmosphere? There are the clearly divergent views of the amount of warming that can result from additional CO2 in future. But even in a worst case scenario of maximum CO2 effectiveness, whatever change that may happen can now only ever have a marginal future effect on global temperature and it certainly cannot lead to a catastrophic and dangerous temperature increase. Whatever political efforts are made to de-carbonize economies or to reduce Man-made CO2 emissions, (and to be effective at temperature control those efforts would have to be universal and worldwide), those efforts can only now affect at most ~13% of the future warming potential of CO2 even up to the unthinkably high level of 1000 ppmv. To quantify directly what might be achieved, the comparative table below show the remaining effectiveness of each 100 ppmv tranche up to 1000 ppmv, with the total global warming in each of the five logarithmic diminution assessments. The table shows the likely range of warming arising from these divergent (Skeptical and IPCC views), that would be averted with an increase of CO2 for the full increase from 400 ppmv up to 1000 ppmv. 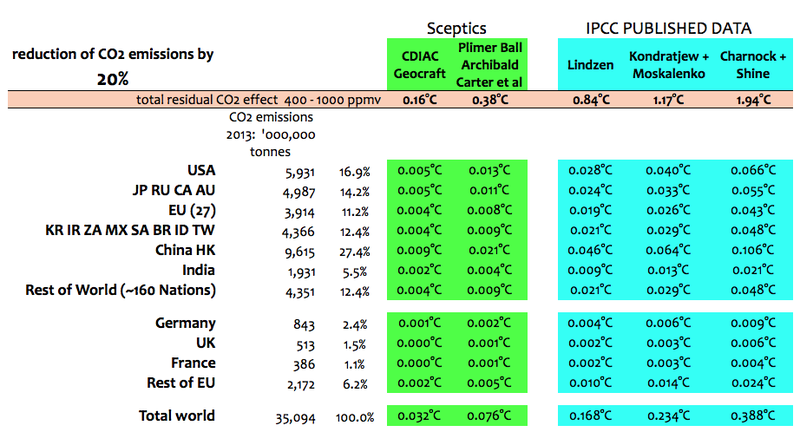 In addition in pink the table shows the temperature effect of doubling CO2 concentration to 800 ppmv, (assessed Climate sensitivity, (shown in pink)). These calculations discount any feedbacks. Alarmist climate modellers assume significant positive feedbacks caused by a slight increase in temperatures resulting in greater water evaporation that then increase the postulated amount of water vapour in the atmosphere so as to exaggerate the amount of warming that might arise from increased Man-made or Natural CO2 increases. However such temperature feedbacks are questionable and could well be either negative or positive. In any event they are probably not massively positive as assumed and relied on by Catastrophic Anthropogenic Global Warming alarmists. As shown below, the recent past, (last ~20 Years), shows a significant divergence between models and observed reality, with a marked lack of warming compared with averaged model results. Over this 20 year period Man-made CO2 emissions, that have escalated by some ~+60% since 1996 and atmospheric CO2 once concentration has risen by ~+10%, (360 ppmv – 400 ppmv). In the past Global Warming advocates have always asserted that all increases in the concentration of CO2 are solely Man-made. However the biosphere and long term slightly warming oceans will also outgas CO2 over the long term, century by century. And the recent IPCC report now asserts that only ~50% of the current increase in CO2 is Man-made. The historic record shows that CO2 concentrations lag behind any temperature increase, rather than being a consequence of it. The delay period is about 800 years. It is extremely unlikely that the Developing world is going to succumb to the restriction and non-development of their economies on the grounds of reducing CO2 emissions. So the Developing world’s CO2 emissions will continue to escalate whatever is done by Developed nations. These figures show that whatever the Developed world does in terms of decreasing CO2 emissions the outcome is likely to be absolutely immaterial, both for the increase of CO2 for the next 100 ppmv and even for doubling the current CO2 level up to 800 ppmv. These results for countries and country groups show a range for whichever scenario of only a matter of a few thousandths to a few hundredths of a degree Centigrade. The table below is based on BP data on CO2 emissions by country. and the aggregation of that data into nation groups. It assumes that the amount of CO2 released by each of the world’s nations or region is eliminated and this table shows the likely warming effects that might be averted both from the point of view of the next 100 ppmv and then as if the the current CO2 level is doubled to ~800 ppmv. The impact of any action taken by Man-kind to try to control climate by CO2 reduction can only have such minimal effect as to be unnoticeable within the inevitable noise in the climate system and is thus absolutely irrelevant. the changing global temperature patterns, the current 18 year+ standstill and likely impending cooling. that Europe as a whole now only accounts for ~10% of world CO2 emissions and is likely to drop to ~7% by 2030.
that the UK itself is now only about ~1.3% of world CO2 emissions and is likely to drop to ~0.9% by 2030.
normal daily temperature variations at any a single location range from 10°C to 20°C.normal annual variations value can be as much as 40°C to 50°C. As the margin of error for temperature measurements is about 1.0°C, so the minuscule temperature effects shown here would only arise from the extreme economic efforts of those participating Developed nations attempting to control their CO2 emissions. Thus the outcomes in terms of controlling temperature can only ever be marginal, immeasurable and thus irrelevant. It could be not be significantly influenced by any remedial de-carbonisation action, however drastic, taken by mankind. all concern over CO2 as a man-made “pollutant” can be entirely discounted. it is not essential to disrupt the economies of the Western world to no purpose. this does not include the diversion of employment and industries to other nations, where concern over Global Warming is not a priority. this is deliberate economic self-harm that can be avoided, if the concept of Man-made global warming from CO2 emissions is refuted. Those simple calculations are set out here. these vast resources could be spent for much more worthwhile endeavours. were warming happening, naturally or enhanced by mankind, it would provide a more benign, productive and supportive climate for the biosphere and mankind. any extra CO2 is already increasing the fertility of all plant life on the planet. if warming is occurring at all, a warmer climate would provide a future of greater opportunity and prosperity for human development, especially so for the third world. the Nations committed to take action on Green thinking by decarbonisation, whatever the costs they incurred to themselves, might only ever effect virtually undetectable reductions of World temperature. it is clear that all effectively minor but extremely expensive attempts the by the few convinced Western nations at the limitation of their own CO2 emissions will be inconsequential and futile. Professor Judith Curry’s Congressional testimony 14/1/2014. Professor Richard Lindzen UK parliament committee testimony 28/1/2014 on IPCC AR5. over the last eighteen years or more, the world should now fear the real and detrimental effects of global cooling, rather than being hysterical about limited, previously beneficial or now non-existent warming. This entry was posted in Uncategorized on September 13, 2014 by edhoskins. Those figures are “All other things staying the same”. But climate is a complex, chaotic system and carbon-dioxide does not act alone. It interacts. Clouds are a huge uncertainty in climate science – no one knows how they are created. What if the climate system reacts to warmth and CO2 by creating more sunlight-reflecting clouds? Maybe helped by the microbes that help to create clouds. Or perhaps changes in the Sun’s magnetic field, or plasma, or ultra-violet output. There’s no overall theory that comes near to explaining the last couple of thousand years of climate. Something’s going on that climatologists don’t understand. All that I have been trying to do is to use IPCC numbers to show the range of outcomes from increasing concentrations of CO2. As they themselves concede, that the impact of CO2 diminishes logarithmically, they show that the magic upper limit of 2degC is simply unattainable. I would agree that there are many different influences on climate, but I do not think that there is any massive positive feedback, as would be required even to reach the 2degC. And according to Richard Tol any increase up to 2degC is definitely positive economically.